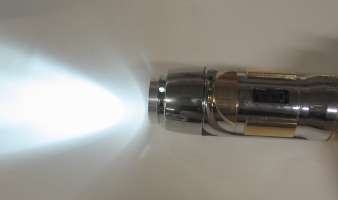 This tutorial will show you how to convert your 2005 Master Replicas Mace to a 3watt Luxeon using the conversion kit that I offer. 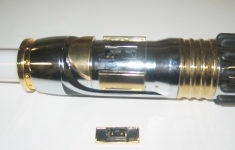 The saber will retain all sound functions and use the original switch. 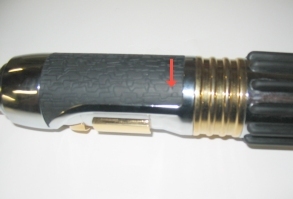 You must make sure your hilt is the same design as the one shown in this tutorial. I make no guarantees that the wiring etc that I say to use in this tutorial will be the same in all models. 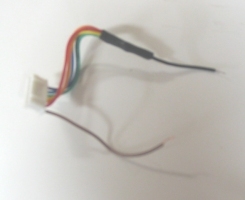 You will need to have basic soldering and mechanical skills to do the conversion. You can reuse the stock MR blade by putting some clear or reflective tape around the base to make it a tad bit bigger or use one of our blades. When finished you will have one very strong saber as everything between your hands and the PolyC blade will be metal to metal with no weak plastic. 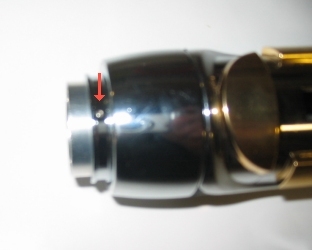 Remove belt clip knob using a 5/64" allen wrench. Flip over and remove set screw using a 1.5mm allen wrench. 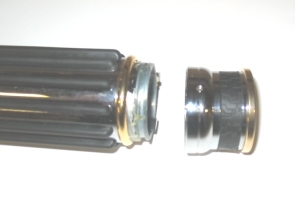 Remove 2 set pins..one on each side. Carefully pry off switch button. Remove 3 set screws around blade ring using a 1.5mm allen wrench. 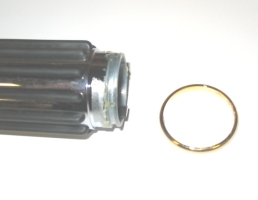 Remove blade ring and o-ring. 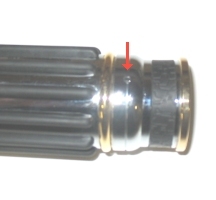 Carefully pry back rubber grip to reveal hidden screw and remove it. You can now push the blade/electronics out the pommel end. 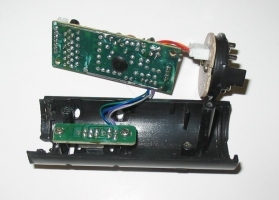 Remove the 3 screws on the electronics assembly and remove the cover. 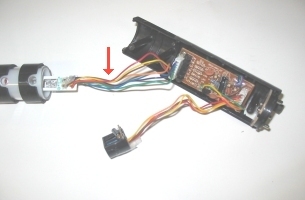 Pull the electronics out of the blade and cut the wires as shown. Unplug the power wires and the shock/motion sensor. Disassembly is now complete. 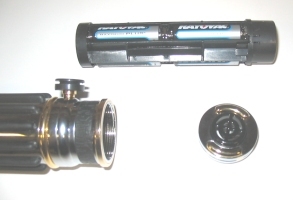 These are the parts needed to rebuild it along with the mace conversion kit. 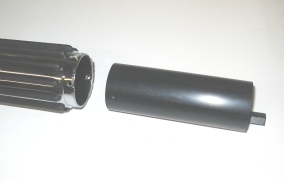 Slide the blade holder of the conv kit into the hilt all the way. This may require pushing from inside the hilt. 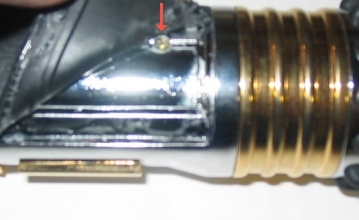 Find the 3 marks where the blade ring set screws where seated against the hilt. Drill all 3 of them out with a 7/64 drill bit. 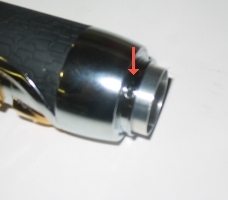 Remove the blade holder from the hilt. Replace electronics cover and rear screw. Line the ridge on the new blade holder up with the ridge on the stock housing. Cut the housing where the bottom of the new blade holder is. 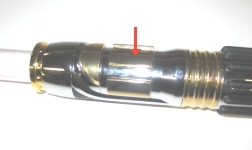 Remove center section as shown. Remove the electronics cover once more and clean out any shavings. 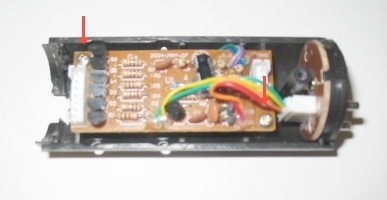 Remove the 2 screws holding the module in place. Lift the module out of the way. 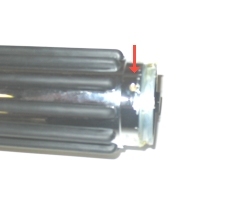 Remove the housing from your shock/motion sensor. 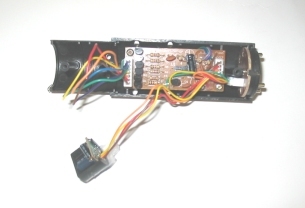 Using a hot glue gun attach the shock/motion sensor as shown. 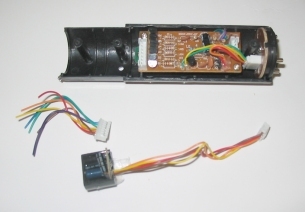 Replace the module and screws. 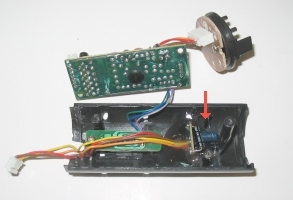 Plug the shock/motion sensor back in. 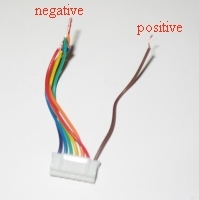 Connect all of the negative wires together as showmn. 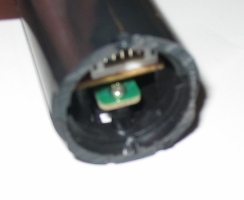 Solder a single wire to the negative bundle and cover with heat shrink tubing. 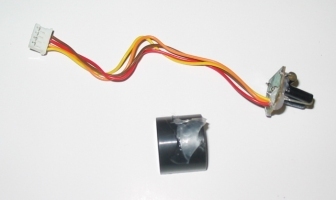 Mount LED to heatsink using thermal tape. 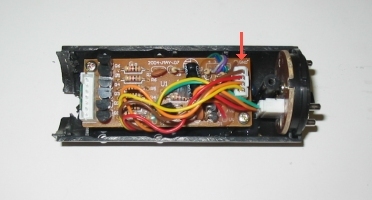 If you opt not to use tape, just rest the LED on the heatsink. Solder the wire bundles onto the LED. Thread the heatsink into the blade holder. Remember to install the optics as well. Plug the wiring harness back into the board. 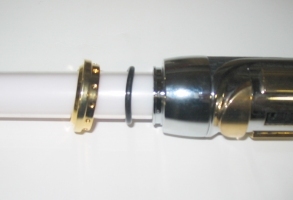 This is the completed assembly ready to go back into the hilt. 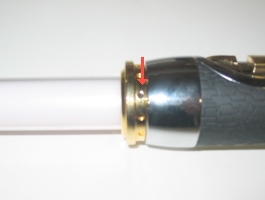 Make sure you have it aligned just like shown, otherwise it will not go into the hilt correctly. 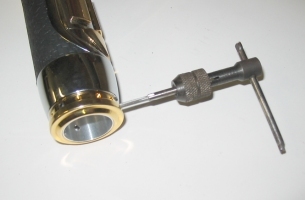 Carefully slide assembly into hilt making sure that set screw holes will align properly. 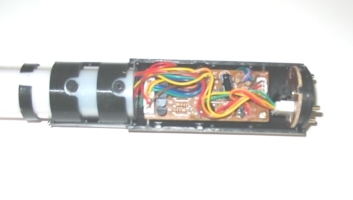 This is what you should see after inserting the electronics. 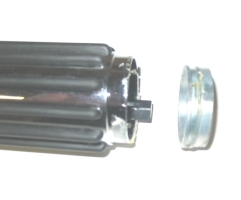 If your housing is aligned with the blade holder correctly, try rotating the entire thing 180 degrees. Now is a good time to slide the battery housing in and make sure everything works. Replace hidden set screw to hold everything in place and glue the grip back down. Replace everything else in reverse. Don't forget to reinstall the battery housing. 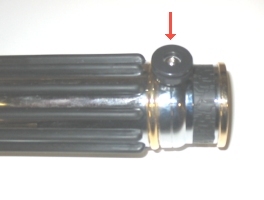 In most conversions this is disposable, but for this saber you MUST have it in the hilt. 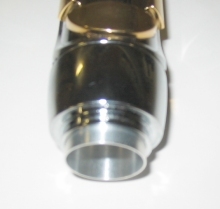 If you have one available tap the blade retention holes out with a M3x.5 tap. Otherwise you should be able to force the set screws to cut the threads. 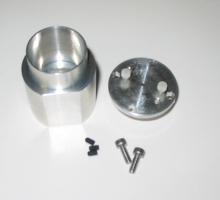 Install new longer set screws that came with the conversion kit. Last edited by Lord Maul; 05-28-2010 at 10:12 PM.